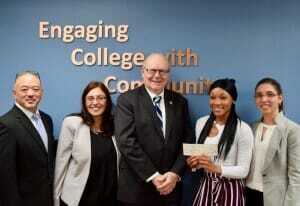 Ebony O’Neal, a Medical Billing and Coding student at the College of Staten Island’s (CSI) Workforce Development and Innovation Office has received a $1,000 cash award and top honors from the Continuing Education Association of New York (CEANY) as the Regional & Charles A. Burns Outstanding Adult Continuing Education Student for the New York South Region. Being a stage-4 cancer survivor, O’Neal achieved excellence by demonstrating persistence, drive, and success in overcoming obstacles to achieve her educational goals. While still undergoing treatment, she was able to earn a Bachelor’s degree at Berkeley College, earn her Medical Billing and Coding credential at CSI, and is currently pursuing a Master of Public Administration at Long Island University. In addition to O’Neal’s prestigious award, Jasmine Cardona, Executive Director of CSI’s Division of Economic Development, Continuing Studies, and Government Relations, was honored with CEANY’s 2018 Outstanding Experienced Continuing Education Professional Award. The award extols distinguished contributions to the advancement of program planning, to applications of continuing education theory and practice, to marketing, to business and industry linkages, to leadership, and to student success. For the past ten years, Cardona has diligently sought to address critical skill gaps in high-growth industries, working to provide quality, flexible, and cost-effective training to support the educational and training goals of individuals and organizations. She has embodied the division’s mission of “Engaging College with Community,” by empowering Staten Island’s economic engine, one talented and driven individual at a time. The Outstanding Experienced Continuing Education Professional award recognizes experienced continuing education professionals by honoring leaders who strive toward the highest levels of personal and professional accomplishment and who excel in continuing education. The year 2018 marks the first year that CSI has been formally recognized with two of CEANY’s top honors. CEANY dedicates itself to the promotion and support for quality programs of public continuing higher education in New York State. For more info on CEANY and their mission, please visit their Website.